A financial planner can help you and your husband determine how to maximize the benefits of retirement income. 1. Does My Ex Husband Have to Be 62 Before I Can File Social Security Benefits on His? 2. How Long Do You Need to Be Married to Receive a Deceased Partner's Social Security Benefits? 3. Can an Ex-wife Receive Social Security Benefits From a Dead Husband? No matter how well you've prepared for retirement, transitioning to living off your benefits involves some hefty number crunching and serious decision making. If you're married, both spouses have retirement benefits and both choose to take them at the same time, your household will receive a larger monthly income than if you were single. 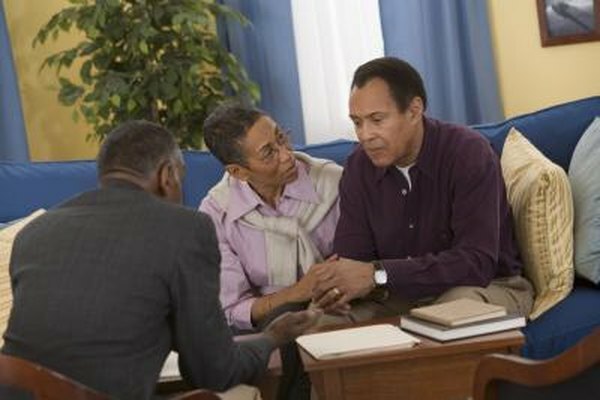 If you're divorced or widowed, you may still be entitled to all or a portion of your husband's benefits. However, in some cases, waiting to receive your husband's benefits may have financial advantages. Most retirement benefits offer penalties for taking money out too early and incentives for waiting. You can take money out of your 401(k) or IRA penalty free starting at age 59 1/2, but you can save money by waiting until age 70 1/2 because the longer you wait to take distributions, the longer you'll be able to avoid taxes, unless you have a Roth plan. The IRS requires you to start receiving distributions no later than 70 1/2 to avoid penalties. Similarly, you can start taking Social Security at age 62, but your monthly payments will be less than if you wait until your full retirement age, which differs based on your birth year. If you wait until age 70, you'll receive even larger monthly payments. While your husband can take his benefits when you retire, it may be more financially advantageous to live on your benefits while allowing his to mature, or vice versa. If you're divorced, you may still be entitled to receive a portion of your husband's retirement benefits when you retire. To claim a portion of your husband's Social Security benefits, your marriage must have lasted at least 10 years, and you must be unmarried and at least 62. Your work credit must also be less than his. A judge or you and your husband will ultimately decide how 401(k) and IRA benefits are divided. However, they may be considered marital property as long as your husband contributed to them while you were married. Marital property is property to which both spouses are entitled. If your husband contributed to his benefits before you were married, a portion of the benefits may not be considered marital property. If you want to wait to receive these benefits until you are retire, ensure you have them rolled into an account in your name. If your husband passes away, you can receive his benefits with yours when you retire. By default, you are the beneficiary of his 401(k), and you must agree in writing if he wants to bequeath it to someone else. However, he must specifically name you as his beneficiary to ensure you will receive his IRA. Once they transition to your ownership, these accounts function the same way they did when your husband owned them, so you must be at least 59 1/2 to take penalty-free distributions. You may be able to modify the type of account holding the benefits, though a financial adviser can give you more information as to which option is best for you. If your husband worked, you can also receive his Social Security death benefit when he passes away. You can maximize your payout if you wait until full retirement age to take his benefits, but the Social Security Administration says you may begin receiving payments as early as age 60, 50 if you are disabled and any age if you care for your husband's minor children. Charles Schwab: When Should You Take Social Security? ElderLawAnswers.com: Do Surviving Spouses Have a Right to a 401(k) or an IRA?